During the years General Motors’ Electro-Motive Division (EMD) produced F-units (1939–1960), the diesel builder and its Canadian counterpart General Motors Diesel (GMD), sold approximately 4,700 examples. This figure starts with the FT and concludes with the final F9s. Of that total F-unit production number, less than 10 percent were FP-series (FP7 and FP9) models. 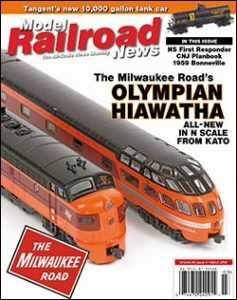 With the announcement of a GMD FP7 from Rapido Trains for the HO-scale market and this edition’s cover story featuring The Milwaukee Road EMD FP7 from Kato in N scale, this seems like a good opportunity to take a look at the prototype FP7 (both EMD and GMD) diesel and models produced for HO and N scale over the years. As David Otte notes in his background information on the FP7 for his presentation of Kato’s new model, a shortcoming for EMD’s four-axle A-unit was its lack of space for carrying sufficient water for use in steam generators. While roads did purchase cab-equipped F-units (A-units) with steam generators for serving in passenger train duties, the space situation for water made them require stopping for refilling of water more frequently than companion B-units (cabless F-units). Additionally, single F-units with steam generators on smaller passenger trains accentuated this water storage problem. The remedy was to bring the A-unit’s ability to haul water to a similar level that EMD provided for its steam-generator B-units. To make room for additional water storage, EMD lengthened its F7 frame by four feet. The result was 1949’s FP7 diesel locomotive. EMD’s FP7 production went to U.S. railroads for the most part. EMD sent FP7 demonstrators to Canada, which ended up on Soo Line’s roster, but Canadian Pacific and Ontario Northland purchases saw assembly in London, Ontario, by General Motors Diesel. According to Diesel Era’s EMD’s FP7 and FP9 The Dual-Service Cab Unit (2009, Withers Publishing), those GMD-built FP7s marked the first production diesels for this Canadian division. Railroads in the U.S. buying FP7s included a wide range from Alaska Railroad to Florida East Coast with just more than 300 built. The largest U.S. fleets of FP7s worked for Atlantic Coast Line (40), Louisville & Nashville (45), The Milwaukee Road (32), and Pennsylvania Railroad (40). For GMD, the FP7 production came close 60 with Canadian Pacific owning just more than half produced, rostering 35 units. There are production phase differences for FP7s with early or Phase I models appearing from 1949 to 1952 and late or Phase II FP7s making up 1953 examples. The successor FP9 saw introduction in 1954, and its production of new models was exclusive to GMD. An FP9 footnote is EMD’s rebuilding of Chicago & North Western FTs in 1954 and returning them to the road as FP9s. F-unit models enjoyed a prominent spot in most every hobby line in HO scale (1/87) from the days of the prototype introduction and forward. However, the first plastic HO-scale FP7 didn’t appear in the 1950s or 1960s; it surfaced in the mid-1970s. Coming near the conclusion of a group of EMD diesel prototypes produced by Roco in Austria and imported and cataloged by Atlas in North America, the plastic fully assembled FP7 diesel debuted in late 1975. Atlas’ HO-scale FP7 stayed the longest in the hobby company’s catalog of any of the Roco-made EMD diesels with releases and revisions into the 1990s. The original FP7 was a single-headlight example with dynamic brakes. Releases in the 1975 production presented mostly prototype FP7 owners with the exception being the yellow-and-silver Warbonnet Santa Fe offering. You can view these vintage FP7s by visiting the HO-Scale Trains Resource. Examining the original Atlas FP7 model from 1976 and checking Diesel Era’s EMD’s FP7 and FP9 The Dual-Service Cab Unit, I spot this shell to be a Phase II that should match up EMD production examples from early 1952 to the end of 1953 and the conclusion of FP7 manufacture. This version of the FP7 featured vertically oriented louvers between the portholes on the unit’s side, and the Farr-type radiator grilles over the portholes included vertical slits for this portion of production. Earlier (1949–1951) FP7s sport horizontal louvers between the portholes and horizontal openings in the radiator section over the portholes. The Diesel Era guide notes that EMD revised F7 production in early 1953 to include a wider 48-inch dynamic brake fan on the roof versus the originally issued 36-inch fan. I find only a few Alaska Railroad and Southern Pacific FP7s from 1953 came with dynamic braking (48-inch fan). So, what buyers of FP7s obtained examples with features matching the original Atlas release? This would spec out generally to an FP7 with a single headlight, dynamic brakes with 36-inch fans, and vertical louvers and vertical radiator grille openings. Research suggests to me that Pennsylvania Railroad’s FP7s may be the nearest prototype match to this one-version shell. The challenge, beyond the phase match, is finding roads that bought single headlight FP7s. The original Atlas HO-scale FP7, illustrated by a 1975-issued Santa Fe example, featured a single-style shell with Phase II body, 36-inch dynamic brake, and a single headlight. For its return in the 1990s, the model gained a better representation of steam generator details, and models came with additional variations for headlight and dynamic brake use. This maroon-and-gray Canadian Pacific is a newer example of this Roco tooling and sports a 48-inch dynamic brake fan and Phase II body details. In 1991, Atlas brought back the FP7 with shell variations depicting single and dual headlights and with and without dynamic brake details on the roof. Examining examples from the early 1990s run, it appears the production phase stuck with Phase II side panels, while versions with dynamic brakes included the larger 48-inch fan. Another area that received improvement was this model’s steam generator roof details. The original effort included only a button-shaped detail centered in the rear roof panel to denote a steam generator, which, to my knowledge, is not accurate. The 1990s release corrected the roof details for the steam generator section. This revised tooling moves to E-R Models in 1998 with a release that is the most recent known for this veteran FP7. Decked out in Daylight colors is a Cotton Belt example of InterMountain Railway’s HO-scale FP7 diesel locomotive model. InterMountain added an HO-scale FP7 to its line in late 2006. You’ll find this high-quality HO-scale FP7 in early (Phase I) and late (Phase II) production versions and with an accurate representation of dynamic brake equipment (or lack of it) for various road names, as well as single or dual headlights. The Highliner toolings that serve as the basis for Athearn’s Genesis F-units allowed for a kit-bash FP7. The procedure involves cutting the body shell apart and inserting a section behind the dynamic brake area that provides the needed length to bring the standard F-unit to the required length to match EMD’s FP7. This concept didn’t originate with this contemporary tooling. If you check Model Railroader’s April 1972 edition, you’ll find an article describing a somewhat similar approach to chopping a pair of classic Athearn “Blue Box” F7A shells and putting them back together to make an FP7. Introduced about a decade ago, Athearn Genesis expanded its line of high-quality F-units with an FP7 release. These models include a wealth prototypical details and accurate production characteristics. On the left is a Zephyr scheme Western Pacific example with a late-service-looking Southern Pacific FP7 wearing the road’s “bloody nose” livery. Compare Athearn’s Southern Pacific FP7 model and the prototype image of the same road number included in this article. This was the original method and approach to the first Athearn Genesis FP7s announcement in the spring of 2009. Athearn’s Chris Palomerz confirmed that more recent Genesis FP7s now feature a new shell that omits the cutting together segments for better overall appearance to the release. For these contemporary Athearn Genesis FP7s, the concern about production phase details, dynamic brakes, and headlights is moot. As with the manufacturer’s other high-quality Genesis diesel releases, models present details aimed at correctly replicating prototypes. Over the years, you’ll find bodies with Phase I and Phase II variations, accurate depictions of dynamic brakes, and other features. Next for HO will be Rapido Trains GMD FP7 diesel due later this year. An announcement for this release is present in this edition of Model Railroad News. For this N-scale survey, I’ll include a die-cast metal pair of FP7s and a non-working plastic static model among the releases. The first mass-production FP7 for the 1/160 market came from Model Power in 2001. According to the online N Scale Model Railroading Projects & Resources website, the releases from Model Power included two versions. The first was a Chinese-made FP7 sold in packaging labeling it a “train set loco” that came with a caboose model matching the engine’s road name. Decorated for Pennsylvania Railroad, Model Power’s FP7 is a 21st Century addition to the company’s product line. Now distributed by Model Rectifier Corporation, Model Power’s FP7 plans include sound offerings for new production releases. A second N-scale FP7 from Model Power debuted in 2006 and featured a similar-looking die-cast metal shell. This effort came with two production phase variations, as per prototype (inclusion of dynamic brake details or lack of the fan on the roofline). At press time, Model Rectifier Corporation’s website shows a new production of N-scale FP7s for Model Power with releases coming with standard non-sound DC or with Digital Command Control and sound output. InterMountain Railway Co. offers its FP7 in N scale with road-accurate details in versions with standard DC, DCC, and DCC-sound. This view shows past Louisville & Nashville (left) and Chicago Great Western (right) N-scale FP7s issued by InterMountain. InterMountain Railway Co. is the only current hobby manufacturer that markets an FP7 in both HO and N scale. The N-scale FP7 came out in 2008 and presents road-specific details, as well as covers production phase variations. InterMountain offers standard DC, DCC, and DCC sound (ESU LokSound) releases for its N-scale FP7 diesel model. Would you consider this among N-scale FP7 releases? This Del Prado effort is a plastic static display model and one of a number of locomotives issued in N scale by this company over the years. The nose contour suggests a similarity to Model Power’s FP7 offering. If you’re involved in N scale, you’ve likely seen the Del Prado series of plastic static display models. This series of plastic locomotives arrive decorated and with a section of track on a display base. These curious display models likely have served hobbyists considering ways to add a prototype to their roster that doesn’t exist as a regular N-scale release, providing fodder for a custom modeling project. The N-scale Rio Grande Krauss-Maffei from Del Prado may likely be of the most adapted for use in a craftsman-level effort to create a working N-scale locomotive from this collection. I’ve found Del Prado models decorated for Santa Fe (which didn’t own this prototype) and Union Pacific. With the other available FP7s in N scale, this release is presented out of curiosity more than anything else. Watch the pages of Model Railroad News for more coverage of Rapido Trains’ coming HO FP7 models and MRC/Model Power’s N scale FP7s. This article appeared in the March 2018 issue of Model Railroad News.